grandma's cookie jar: crafting with grandma - Make Some Minions! I made Minion and Crazy Minion hats for my grandsons and I have to say, they are soooo cute in their hats! Both of the Despicable Me movies are favorites around here, for good reason as they are funny! So, when I was browsing on Pinterest and saw a pattern for making Minions, I thought it would be fun to share it with you . 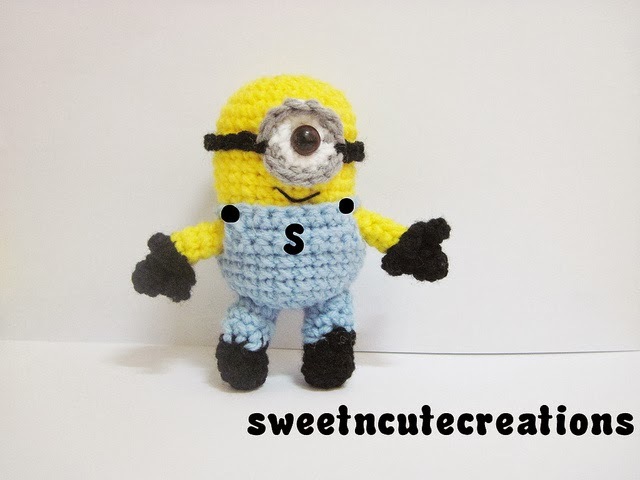 . . and I am pretty sure I will be making some regular and crazy Minions for three sweet boys I love! Follow this link and you'll find a simple pattern for regular Minions; I think it would be very easy to use purple yarn and make the crazy Minions, too! Plus, if you follow the pattern, but use a larger crochet hook, I think you should be able to get bigger Minions. I will be trying both for sure!